The Ohio Veterans and Fraternal Charitable Coalition (OVFCC) is never surprised to hear about veteran and fraternal organizations giving back to their communities. We’ve seen it many times. And many more. And more still. The generosity of veterans and fraternal groups to not only their members, but also their communities is truly something to behold, especially in our current age of economic uncertainty. 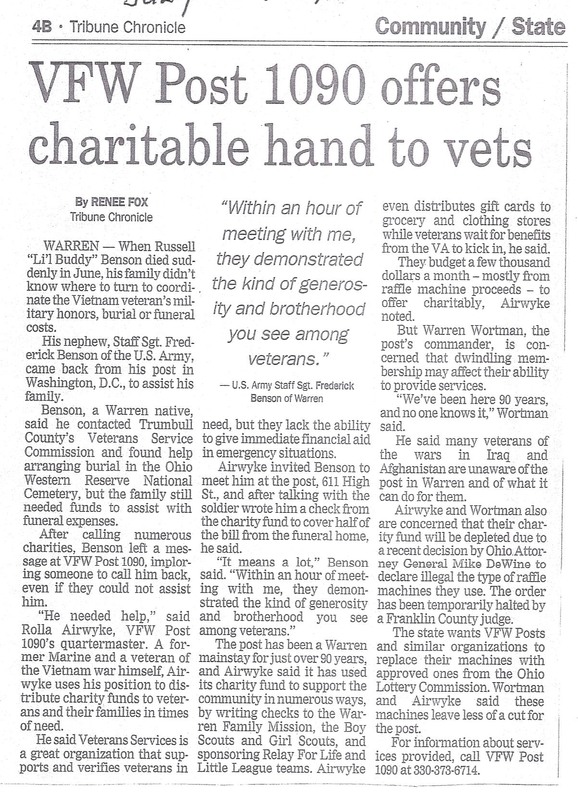 That’s why it shouldn’t come as a shock that the Warren, Ohio VFW Post #1090 has continued this tradition of compassion by donating money to fund a funeral and military honors for a recently deceased veteran. Russell Benson died suddenly in June, and after calls to different national organizations fell upon deaf ears, Benson’s nephew, himself a Staff Sergent in the US Army, called the VFW Post. And the VFW took up arms for one of their own. Post 1090 is also one of many state-wide posts suffering due to recent judicial and legislative rulings with regards to charitable gaming, and the post itself, a town mainstay for 90 years, is running out of time and money, much of which was brought in by electronic charitable raffle machines that the State’s Attorney General has declared illegal. Stories like the one above are good, and speak to just how great the support of veterans and fraternal organizations can really be. But the postscript – the AG’s decision, and a VFW Post clinging to financial life – is really the issue that should be addressed. Else those like Staff Sergeant Benson might still be on the phone trying to find a way to bury his uncle. There are a lot of ways to gamble legally in Ohio but some people in our great state are still finding ways to do so illegally. This has always been an issue in the state, and now the Ohio Casino Control Commission is looking into over 30 places where such illegal gambling may be occurring. Skill games have been around for many years. They are supposed to be based on the player’s skills, unlike slot machines, which are based on chance. Skill games faded out as Internet cafes proliferated but had a resurgence when DeWine and state lawmakers cracked down on the cafes in the past two years. Crackdowns on illicit gambling isn’t new, at least by the Ohio Attorney General’s definition of what constitutes a skill game versus a game of chance. The AG’s crack down on these other, very illegal operations is wholly supported by the Ohio Veterans and Fraternal Charitable Coalition, an organization focusing on raising money for charities, not for owners of illegal businesses. 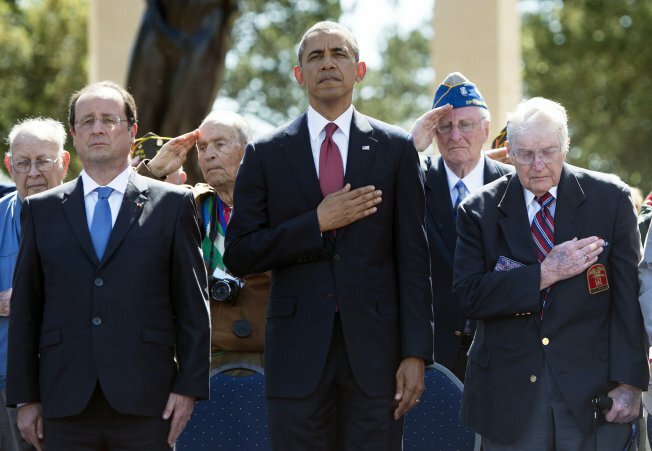 The Ohio Veterans and Fraternal Charitable Coalition (OVFCC) applaud Congress and President Obama for passing, and signing, the Veterans Access, Choice and Accountability Act of 2014. This legislation addresses issues that are important to the care of our veterans and their families both in Ohio and across the United States. The act addresses many of the veteran’s issues that the OVFCC has worked tirelessly to address though charitable initiatives. These issues include equality, education, health and safety, and quality of life. The legislation would improve the delivery of care for veterans who experienced sexual trauma while serving in the military. In addition, the VA secretary would be given the authority to immediately remove incompetent senior executives based on poor job performance or misconduct such as sexual harassment. An expedited appeals process through the Merit Systems Protection Board would prevent political firings or other abuses of the new personnel power, such as retaliation against whistle blowers. The legislation would provide the VA funds to hire additional primary and specialty health care providers along with other clinical staff to increase the department’s capacity to provide high-quality health care to our nation’s veterans. The measure also would provide enhanced incentives to attract more doctors and nurses and other health care professionals to the VA. The VA’s Access to Care Audit found that the need for additional doctors, nurses and other medical providers was the highest barrier or challenge to access to care. The VA’s physical infrastructure plays a significant role in its ability to provide timely, quality care to veterans in a safe environment. The legislation would provide funds to enter emergency leases for facilities that would directly improve veterans’ access to care. The legislation would authorize VA to enter into 27 major medical facility leases in 18 states and Puerto Rico. In many instances, these leases would improve access to care closer to veterans’ homes and increase the availability of specialty-care services in these locations. The legislation would allow veterans who have had to wait more than 30 days for an appointment with the VA to seek care from a private physician, a community health center, a Department of Defense health care facility or an Indian Health Center. Veterans who live more than 40 miles from a VA facility also would be eligible for this program. The legislation would expand the Marine Gunnery Sergeant John David Fry Scholarship to include surviving spouses of members of the Armed Forces who die in the line of duty while serving on active duty. The legislation would let veterans eligible for education benefits under the Post 9/11 GI qualify for in-state tuition. The bill would extend a program about to expire which provides housing for veterans struggling with traumatic brain injuries. For more information, click here for the official American Legion response, and here for the VFW response. When Corporal Alex Haworth returned from to his North Olmstead, Ohio home, it was not before going through myriad difficulties. Haworth is a veteran of the war in Afghanistan, and his return home was delayed substantially by a stay at Walter Reed National Military Medical Center, his injuries stemming from a suicide bomber’s attack. While three of Haworth’s friends perished in the attack, the Northeast Ohio native recovered from his injuries stateside. But sometimes when it rains, it pours. Not only did Haworth have to overcome devastating injuries, but the home he previously purchased for his family was in complete disrepair. With seemingly no other option on the table for the young veteran and his growing family, it was up to the North Olmstead VFW to step in to help a brother in arm in need. Check out the video below to see the outstanding efforts of VFW Post 7647 to support a young man who served his country and was awarded a Purple Heart.